Ex-President Jerry Rawlings has revealed that the Rawlings of December 31, 1981 and Rawlings of today are the same in terms of his “basic and principles”. The 57-year-old ex-President however declined to identify the most important part of his legacy to Ghana that “it is for history and the people to judge.” The former leader made these comments in an interview published in the second edition of the book Ghana – We Mean Business. 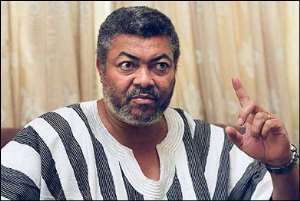 On whether the June 4 Revolution has been a failure, Rawlings said: “The critics have two principal reasons for claiming that the June 4 revolt and its principles and achievements failed. In the first place, some of these critics were affected by the punitive actions of t he revolt in terms of loss of power and/or illegally acquired wealth. They must, therefore, propagate the event as unnecessary. By implication, they have political or personal reasons to conveniently play down the conditions of social decay, economic decline and political stability that made June 4 necessary. Secondly, having conceived and propagated the Pre-June 4 conditions as normal, they would obviously fail to acknowledge any constructive changes that have taken place since the revolt. Having said this, it must be admitted that not all of the revolutionary expectations of June 4 and December 31 have been achieved, especially given the resurgence of criminal and socially nefarious activities in recent times. Several reasons may be suggested for this state of affairs. One is the very high standards of morality and performance of duties that the revolutions of June 4 and December 31 imposed on the country. It is far easier to change institutions and impose appropriate standards of conduct than it is to change attitudes and behaviour patterns formed over a long period of time. The second, which reinforces the first, is the historical-cultural tendency for Ghanaians to see the freedoms that come with democratic politics and constitutional government as a license for lawlessness. In this regard, the conversion of the political consciousness nurtured by the revolution into real participatory democracy is still confronted with the task of fully ensuring the necessary sense of commitment to obligations, alongside awareness about rights.